Where would video games be without Tanks? Strong and durable, able to blast incoming enemy threats into oblivion and completely flatten any landmark in sight. The sense of fearlessness a tank provides is arguably unrivalled; games about tanks have been prominent throughout the ages. Anyone who has ever played a video game will have at some point taken control of a military-grade tank - with the mission to destroy everything! 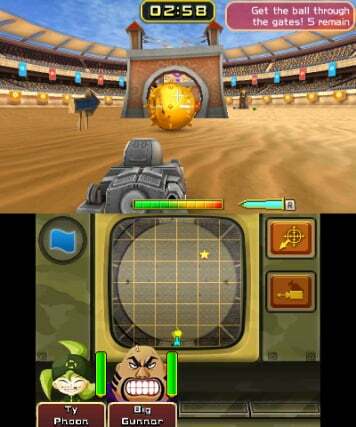 Thankfully Nintendo's very own Tank Troopers for the 3DS eShop doesn't stray far from this classic concept. 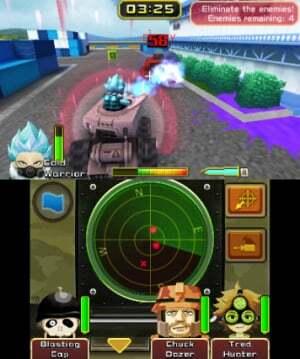 In order to provide the most action-packed tank experience possible, Tank Troopers is divided into two parts: 30 single player missions and a local multiplayer mode. It is important to note how the title places a huge emphasis on the multiplayer portion; this option is located above the solo mode on the main menu - encouraging players to go head-to-head with their family and friends as soon as they begin. Regardless of how tempting this may be, it is advisable to at least try out the single player campaign. The earlier missions act as a tutorial, and eventually you'll be taking on increasingly harder missions over time. The campaign will essentially round-off your skills as a player, morphing you into a lethal threat on the battlefield. The variety of missions in the single player mode remains relatively fresh from start to finish - with patience and persistence often playing a key role in success. 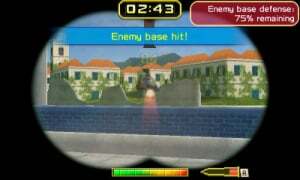 Each mission presents a different scenario. Most of these are inspired by standard warfare objectives such as capturing an enemy base, defending the home base, protecting allied vehicles and eliminating the enemy team. Adding an extra element of fun in between these more serious mission objectives are a few odd but fun tasks. These includes shooting balls into goals, guiding giant bombs to an enemy base and shooting down balloons. It's a pleasant change from the usual wartime scenarios you grow accustomed to over time. Upon completion of each mission you'll earn a ranking, which may (or may not) spur you on to repeat certain levels. The large open arenas that host each battle are filled with explosive objects, blockades, destructible landmarks and environmental scenery. There are also a few linear maps available that constrict tank movement, forcing players to travel from one side to the other. All of these maps are aesthetically pleasing, ranging from sandy deserts, small villages, wide open grassy plains and sunny seaside ports. The colourful nature of each environment makes the game feel very welcoming, despite the destruction contained within. On each map, you can expect to encounter enemy turrets, item pick-ups including the likes of camouflage, spanners that replenish your tank's health and barrels that are ready to explode. Occasionally, fog of war will be active, limiting the view distance you have of the battlefield and surrounding enemies. Enemy tanks are also able to make use of certain abilities. Often multiple tanks will swarm you at once, but thankfully you can activate an artillery function, which helps out when you are completely surrounded. Tank Troopers features an built-in currency system. Certain targets you destroy will drop coins. The coins you earn can then be spent in the garage section of the game, and from here you can purchase more than 30 different tanks with your in-game cash. Each tank also has many paint jobs that can be purchased. Upwards of 50k for a tank becomes an average over time, and different paint jobs can be priced in the thousands. This is enough of a reason to collect as many coins as you can when you're out on the battlefield. The incentive to buy new tanks is linked to the unique stats - each one is ranked by its attack, reload time, speed, armour, range and rotation. The starter tank just can't compete against the higher tiers, making it worth your while to save up. The bigger and better the tank is, the more characters it can house. Purchasing a better tank will not only give you the advantage in the multiplayer, but it can also assist you in the custom single player mode. You can either "take orders" where your tank and troopers are pre-selected for you, or go the custom route - selecting from the tanks and troopers you have purchased. Troopers are what sets this 3DS eShop title apart from other games that fall under the same genre. Troopers are essentially unique hero characters that pop up out of your tank when summoned via the touch screen. With more than 12 to select from, you are bound to have at least a few favourites. Cold Warrior uses icy blasts to freeze enemies, military man Tred Hunter can reveal activity on your radar, while Medica practices love and peace by healing your tank and nearby allies. Other heroes provide abilities that can even enhance a tank's performance temporarily. To use these characters in the custom mode and multiplayer, coins must be spent to unlock them. Each hero has a unique personality and although they aren't quite as charming as certain other Nintendo characters, they certainly make Tank Troopers standout alongside more bland entries within the military action genre. 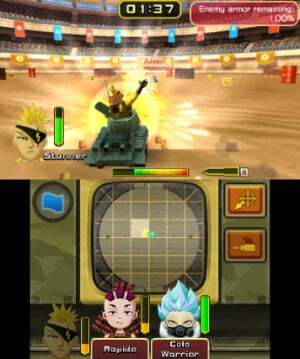 The added sound effects - including the talkative characters during battle - along with the catchy war menu anthem adds to the overall personality and theme of the game. Depending on the size of tank selected, up to four characters can come along for the ride. Each character's special ability can be used temporarily and will need to be recharged after it has been completely drained. The abilities are often important to use at critical times in battle, as you won't always get by with your canon alone. The strategic element here is to assemble a team of troopers that complement each other as well as the chosen tank. For example, having a healer on board with characters that enhance tank abilities and a heavy damage dealer is a good combination. This type of strategy is how you'll win battles. When you've grasped the basics and think you're ready to engage in direct combat with friends or family, Tank Troopers offers local multiplayer where up to six players can blast each other using the one game, or multiple game downloads. The setup is no different to any other game of this variety. You select a mode ranging from free for all, team or bomb battle and then set the time, map and select the tank and characters you will use. Single game download means everyone is limited to the same characters and tank, with just one map to play on. The simplistic design of the title makes it very accessible for all ages. It is easy to pick up and play, with a simple aim and shoot mechanic to fire the tank's canon while moving about and the occasional tap of the touch screen to activate your character's ability. The main controversy surrounding Tank Troopers since its unexpected reveal is the fact it has no online multiplayer. Even by 3DS standards, this is hard to ignore. For a game that is focused on multiplayer tank battles, it is hard to understand why exactly an online mode has been left out. There's not even an option to create a battle against bots. The lack of online is admittedly a major downside, as you're instead reliant on local play with a group of people you will presumably be able to meet and play against on a regular basis. 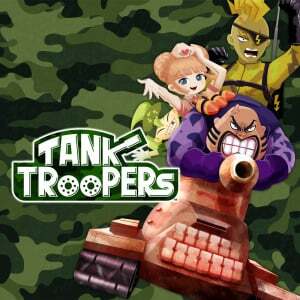 Tank Troopers is exactly what you would expect from a game about tanks. Adding to this is the fact the title manages to adhere to Nintendo's family-friendly criteria while at the same time filling the void when it comes to the lack of shooters across the company's current generation of hardware. The problem is, despite solid foundations, the title falls short simply because it does not offer online functionality. It's this one glaring problem that lets Tank Troopers down. Beyond technical limitations, it is hard to guess why this would be left out of a game that is dominantly focused on player connectivity. Unless you have a close group of 3DS companions you can play with locally on a regular basis, Tank Troopers is hard to recommend solely for the single player mode. There's only so much they can do with tanks... I like the art style though. And I STILL don't know yet: Can you control the tanks like you can in any game OTHER than TANK! TANK! TANK! Does it have tank controls? Now I'm pushing them all to buy a Switch instead. I'd have picked this up about 6 months ago, but not now. Switch port please. I was very interested in this game until they fully revealed the Switch. I keep forgetting that this game exists. Replace Sorely with "Solely" at the end there. You're welcome. Really enjoyed this although it definitely needs online multiplayer. Local is great and download play means you can easily get a full game up and running with five other players and just the one copy of the game but if this had online it would have been the "Splatoon" of the 3DS. Hopefully this is just Nintendo dipping their toe into a possible new IP and if they release a retail version with full online it would be a must buy. @TheVGMLover Leave TANK! TANK! TANK! alone! That game was awesome! @Kayfios Tbh, it would have been way better if you could control the cannon and vehicle seperately, again, like you could in any other game, I believe. How would it compare to Battle Tanx (N64)? 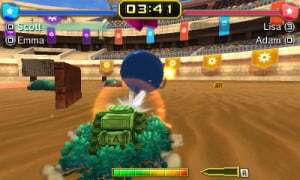 I loved that game as a kid and whenever I hear of another tank-based-game I always am hoping for a similar experience. Since single player campaign is what I would most likely play, I'll probably wait on this...if I get it at all. There's only two things Nintendo should be making that are tank related: Advance Wars and a Tank Dating Simulator. Thank you for eventually reviewing this. With modern Intelligent Systems current track record, the next Advance Wars WILL be a tank dating simulator! @Firelork How dare you defile the good name of Advance Wars. You should be locked up in a dungeon. A skinship dungeon. Oof... I can't imagine it not having Online play... Back to Steel Diver: Sub Wars I go! This game definitely needed online multiplayer, and the fact that's it's not included is a deal breaker for me. You're making seem like heaven is a bad place! @TheVGMLover I can excuse it in that game; arcade games typically have simple controls. Mario Kart does not translate well into an arcade game. What a ridiculous design choice having no online in such a multiplayer-centric game. All this does is make me further want Battalion Wars 3 for the Switch with a good online structure. DLC solo missions and loads of customization.